A thousand welcomes to you, my fellow vapers, vapettes and enthusiastic neo-vapees! 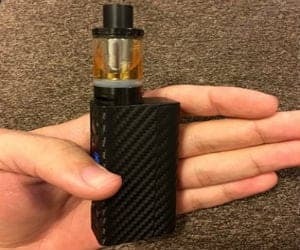 I am coming to you through the fog this morning to deliver yet another ultra-exciting, super-cheap and mondo-awesome vape gear review…this time of a delightful little sub-Ohm tank known as the Aspire Cleito. If sub-Ohming is your bag of chips then you’ll want to stay right here as I take a closer look at just what it is that sets this little beastie apart with an Aspire Cleito Review. Now, those of you not familiar with the brand, Aspire is an offshoot of Eigate Technologies, who’ve been bringing seriously affordable, yet functionally decent vaping products to the market since 2010. What Aspire if offering us this time round, is a revolutionary new coil design that promises to maximize airflow by eliminating the need for a static chimney within the tank. What this would mean is improved flavor and vapor production for sub-Ohm vapers, at a seriously affordable price of around $20. What’s more: marketing for this particular tank, as well as the RTA version, is wholly focussed on the flavor aspect. So it’s all about opening out that flavor profile and taking your e-juice experience to the next level. I don’t know about you but I definitely like the sound of that! Should Aspire actually get this right, it would be a huge step for the brand, there’s nothing like a revolutionary design to build respect amongst buyers, especially in the vaping world. On the surface, this is a really sweet looking deal…It’s time to stock up on some of our favorite juice and test this baby out. I’m ready for the all new Aspire Cleito Tank Review! The Cleito range works great with high VG juices like these 70VG flavors from Naked. First Impression, Look and Feel: The relatively short, minimalist tank is extremely lightweight, due to the inclusion of fewer parts in the new design. It is available in black, chrome and gold. I really love the addition of 4 color coded cuffs in the kit which add aesthetic value, insulate and help you remember which flavor you’ve got loaded. Overall looks are sleek and stylish and even the Food Grade Delrin Drip Tip adds to the aesthetic. The tank is also compatible with standard 510 drip tips also, however the Delrin tip looks better. Killer Airflow: Doing away with the static chimney design, Aspire has thoroughly maximized airflow with the Cleito. Indeed, this is some of the best airflow I’ve seen, with that entire central shaft now freed up to maximize it. During this review I enjoyed out of this world airflow, with intense flavor and vapor production: ideal for a direct lung hitter like myself. Easy Fill: Top fill is super easy on the Cleito, with little room for error. Performance: Now, with both included coils I recommend not making use of the top 10W of range as that will likely result in burnt flavor. Staying under 60W on the 0.2 Ohm coil and under 50W on the 0.4 Ohm coil, you’ll literally be blown away by the flavor. Even vaping a juice I was quite familiar with, I experienced a complexity I hadn’t even known was there…along with a cloud production factor to be reckoned with and swift Ramp on both coils but more so on the 0.4 (obviously). Aspire promised next level flavor and vapor production and that is exactly what they delivered! Coil Replacement: Now one side effect of the elimination of the chimney shaft is the fact that you cannot replace the coils without first emptying the tank. It’s not much of a con though, this is the price of advancement and that added flavor is definitely worth it. Capacity: Given the extreme airflow and vapor production, a slightly bigger tank would have been useful. Cap Heat: The top cap heats up so keep those rubber cuffs handy, you’ll need them for insulation…not just for aesthetics. Now, I also had the opportunity to do a Aspire Cleito 120 Review and good Lord…I loved it! With a slightly increased juice capacity of 4ml, easy, adjustable airflow and insane 0.16 Ohm Maxi-Watt Clapton Coil, I fired it up to 100W and enjoyed warm, intense flavor and vapor production like never before. It measures in a little wider than the previous release but it’s one of my favorite sub-Ohm tanks on the market. I would easily give this beast 5 stars. Aspire has proved themselves as innovators in their class with the release of the Cleito Tank Series and I’m extremely impressed with the performance of their products of late and the value for money they provide. I consider them to be a brand you can trust and I’m confident you will too. I didn’t really have the space in this article to get as descriptive as I'd have liked but let me just say this: Aspire has proved themselves with the release of the Cleito Range. I was so impressed during this review that these tanks have become regular go-to tanks for me, the 120 and RTA included. Aspire promised a revolution in terms of flavor and that is exactly what I experienced. Next time I need to do complex juice review, without a doubt I’ll hook up one of these babies because I know that there’s nothing like Killer Airflow, Massive Claptons and some Organic Japanese Cotton to help you stare a flavor profile right in the face…even if you need to purchase a 120ml juice instead of a 60ml. Kudos Aspire!!! !